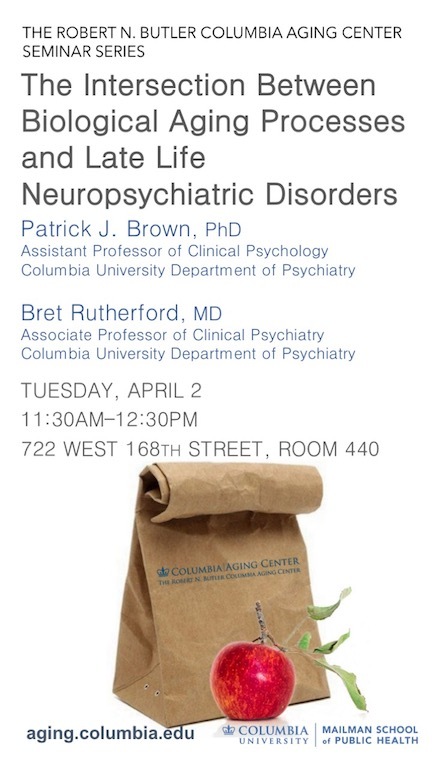 Please join us on Tuesday, April 2, 11:30 a.m. (until 12:30 p.m.) for the brown bag seminar "The Interaction between Biological Aging Processes and Late Life Neuropsychiatric Disorders" by Patrick J. Brown, PhD, and Bret Rutherford, MD. Our speakers are faculty members in the Columbia University Department of Psychiatry. The event takes place in the Allan Rosenfield Building, 722 W. 168th Street, Room 440. ABSTRACT: This talk will be focused on the work currently ongoing in the Neurobiology and Therapeutics of Aging Division at CUMC/NYSPI. This work is in general focused on understanding the complex interplay between biological aging processes and the pathophysiology underlying psychiatric disorders in order to develop improved prevention, early detection, and rationally designed treatment strategies for late life disorders. The work presented will focus primarily on the relationship between cognitive/motor slowing and the nigrostriatal dopamine system, and the intersection between frailty and depression and the role of mitochondrial bioenergetics and inflammatory processes within this intersection.